Grand Prize, presented by Off-World. "Z-RAM Bytes the Dust"
Appearance on the Nightmarez Cafe Halloween Party. "Z-RAM Bytes the Dust"
Filmed at Le Monde Mini Golf in Tulare, CA. Image. 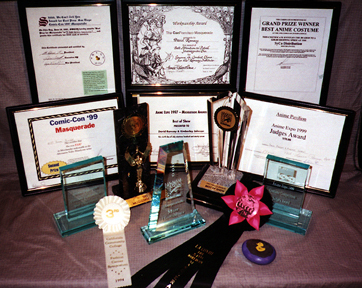 Comic-Con International 1997 Report. "Z-RAM Bytes the Dust"
Image. AnimeExpo 1997 Report. "Z-RAM Bytes the Dust"
Trophy: Best in Show, presented by CCI. "Z-RAM Bytes the Dust"
Best TV or Movie Character Re-creation, presented by AAA American-International. Best Japanimation or Live-action Sci-Fi Japanese Film Characters, presented by Kimono My House. Costume With the Best Prop (for their incredible display of guts), presented by Shh We Can't Tell You (SWCTY). Certificate: Best in Show. "Z-RAM Bytes the Dust"
"Z-RAM Bytes the Dust" and "Z-RAM" Copyright 1997 David Ramsay and Kimberly J. Ramsay. All rights reserved.